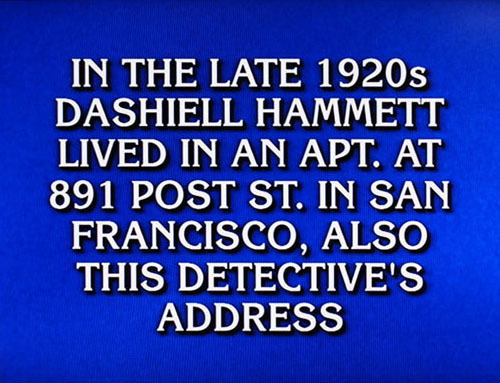 This clue from the December 19, 2013 episode of Jeopardy makes the perfect lead-in: Dashiell Hammett not only wrote The Maltese Falcon in this tiny studio apartment, he used it as the model for Sam Spade’s apartment in the novel. More recently, my friend Bill Arney lived here for sixteen years, moving out in 2010. 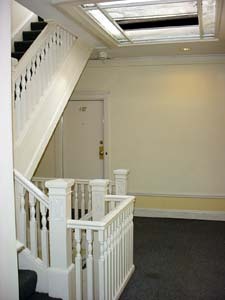 During his long tenancy, Bill spent his spare time restoring the apartment to how it probably looked in Hammett’s day. The following photographic tour shows how the project stood in 2003. Bill Arney (left) and Mike Humbert in the room where it all happened. 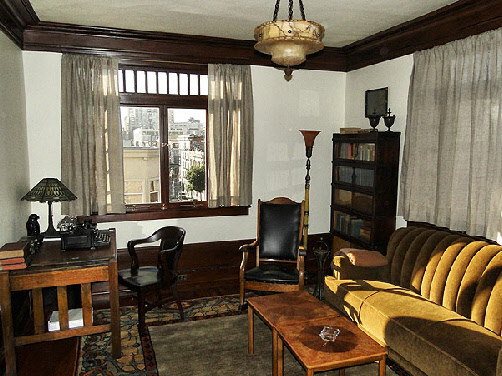 I think it’s safe to say that San Francisco resident Bill Arney is a Dashiell Hammett fan. His bookshelf is filled with books by and about Hammett. He owns a trenchcoat and fedora. 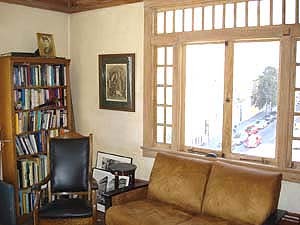 And, most importantly, he lives in the same apartment in which Hammett wrote The Maltese Falcon over 75 years ago. 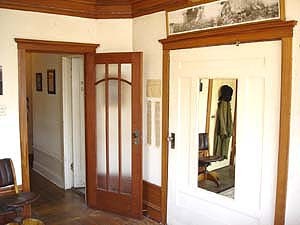 In fact, several times a years, Bill opens his home to the public as part of Don Herron’s Dashiell Hammett Tour. It was on Post Street, near the Hyde streetcar line. It was on the fourth floor. It was a one-room studio, where the bedroom became the living room when the murphy bed was raised. It had a 90-degree bend in the hallway. It was necessary to pass the bathroom on the way to the corridor door. 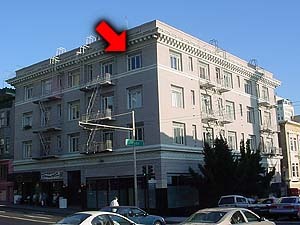 Hammett lived in the upper right apartment on the fourth floor. The neighborhood is on the border between Nob Hill and the Tenderloin, which is somehow fitting. The gate guarding the front entrance. It's necessary to be "buzzed in." 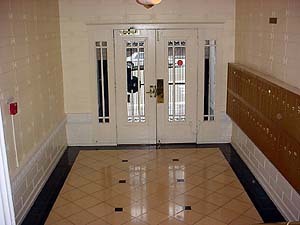 The front doors, as seen from the lobby. 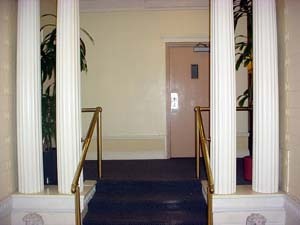 The lobby, resembling a Greek temple. 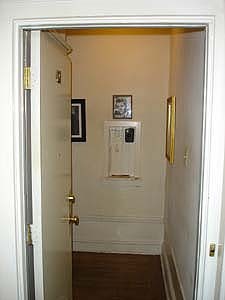 The door in the back wall opens into the tiny elevator. The elevator, as seen from the inside. 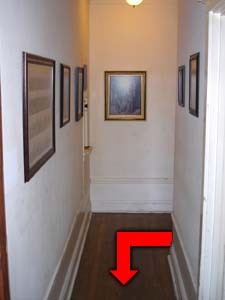 The innocent-looking door opens onto a hallway that immediately turns 90 degrees to the left. The hallway contains several photos pertaining to both Hammett and old San Francisco. This view is from the combination bedroom/living room. That's the door to the bathroom on the right edge of the picture. 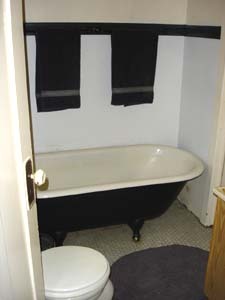 The bathroom, complete with clawfoot tub. The combination bedroom/living room, with the murphy bed in the down position. 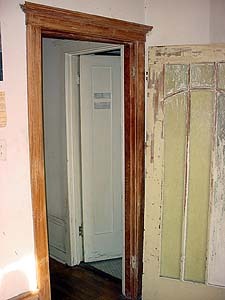 The living room door as it looked when Bill started restoring it. 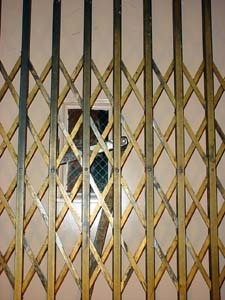 Note that both the wood and glass are buried under decades of old paint. Here's how the door looks a lot of elbow grease later. This is also a good view of how the murphy bed look when it is put away. Bill's trenchcoat and fedora hang on the door to the miniscule kitchen. 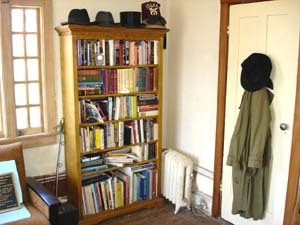 Note the steam-heat radiator next to the bookcase. When this picture was taken the window frame had been stripped and sanded, but not stained yet. Resting in front of Bill's other bookcase is his antique rocking chair, duplicating the one in which Brigid O'Shaughnessy sat in The Maltese Falcon. 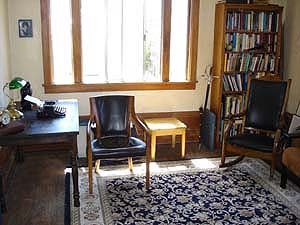 Extensive work was done on the original hardwood floor, as well as adding a new period-appropriate rug. 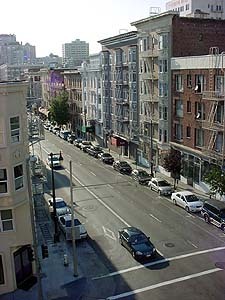 The view of Post Street from the window, largely unchanged since Hammett's day. 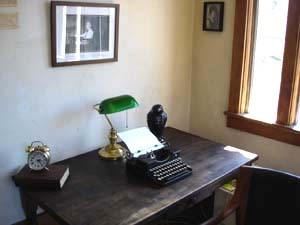 The desk, featuring a representation of Hammett's typewriter. On the left edge (within easy reach of the murphy bed) is Sam Spade's alarm clock and favorite book. Lurking behind the typewriter is the Black Bird itself. Apartment 401 matches every detail, and is the only unit in the building that does. The only discrepancy is that Spade’s apartment had a breakfast nook, which no apartment in the building has. Chalk it up to literary license. Over many months now, Bill has been slowly returning the tiny apartment to its late-1920s glory. He has painstakingly chipped away decades of paint from the natural wood molding, and relaid sections of the hardwood floor (he rejected the landlord’s offer to install wall-to-wall carpeting). When he first moved in, many of the original touches had been removed or updated, but Bill has scavenged many usable pieces from the basement or other units that were being remodeled. Such is the case with the murphy bed. When the bed is closed, all that is visible is a large painted door with a full-length mirror attached. This door does not lower down, as you might expect, but rather pivots horizontally on an axis (remember Abbot & Costello meet Frankenstein?). 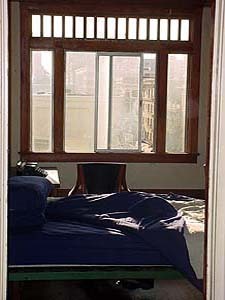 When the door is flipped completely around, the mattress, secured to the hinged bedframe, can then be lowered down. If the door is only pivoted halfway, the walk-in closet is accessible. When the bed is lowered, it dominates the small room. It becomes easy to visualize Brigid O’Shaughnessy napping in Spade’s bed, with one hand – and a gun – under the pillow, as she was in chapter 10 of the novel. To one side of the bed is a small desk that acts as a shrine of sorts to both Spade and Hammett. Belonging to Spade is his tinny alarm clock and his copy of Celebrated Criminal Cases of America, by Thomas S. Duke (both mentioned in chapter two), and the black bird itself. The typewriter, of course, represents the one on which Hammett wrote his most famous novel. A bedroom door was also salvaged from elsewhere in the building. Originally caked in countless layers of paint, Bill has since restored the wood finish, as well as replacing the pebbled glass inserts. The kitchen (not photographed, at Bill’s request) is about the size of the desk at which desk I’m typing this, containing only a small stove and sink, with a window on the left. The bathroom is vintage, with a clawfoot bathtub and a floor of tiny hexagon tiles. This is where Spade strip-searched Brigid in chapter 19 (a scene that, sadly, did not make it into the movie!). So how did Bill originally get involved in this labor of love? Simple. Over a decade ago, he took the Don Herron tour. A few years later, he noticed the Post Street building, which he remembered from the tour, had a vacancy. And now he himself has become part of the tour. 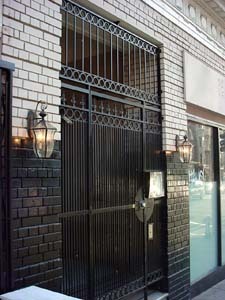 In March of 2005, Friends of Libraries USA recognized Bill’s dedication to restoring Hammett’s old digs by placing a brass plaque on the front of the building. 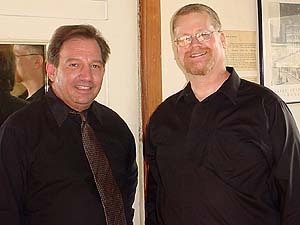 Bill admits he never would have had the apartment ready in time for the ceremony without the help of his neighbor Joe Hagen. To see the the pictures of that day, click here.